Until now, multi-factor authentication (MFA) has been out of reach for many due to the complex integrations and burdensome on-premises management, which makes it impossible to implement without a large IT staff and considerable up-front expense. By contrast, WatchGuard’s AuthPoint solution is a Cloud service, so there’s no expensive hardware to deploy, and you can engage with it from anywhere using WatchGuard Cloud’s intuitive interface to view reports and alerts, and configure and manage the service. AuthPoint service is meant to run without infrastructure or a large staff – and there is no need to install software, schedule upgrades or manage patches. 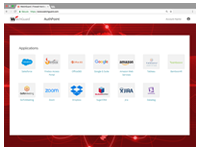 Moreover, the WatchGuard Cloud platform easily accommodates a single global account view or many independent accounts, so that companies can display just the data relevant to a person’s role. AuthPoint service synchronizes with existing user repositories, such as with Microsoft Active Directory or LDAP, to maintain the consistency of the user base as well as allow for a fast deployment. Additionally, users can maintain and use their existing passwords. 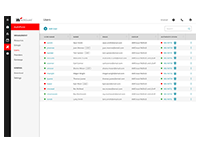 Manage tokens from the WatchGuard Cloud interface with rapid, automated provisioning and de-provisioning. Even better, temporary employees and 3rd party service providers can receive mobile tokens limited to a specific time period for the utmost protection. AuthPoint includes support for dozens of 3rd party integrations, and even more to come from our strong and growing ecosystem – so that you can add MFA protection to all your valuable resources.